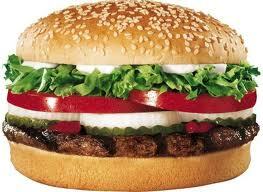 What Ever Happened to the WHOPPER? So yesterday I developed an irresistible urge for a quick hot juicy burger. Coincidently I was at that very moment driving right toward the entrance of a drive through…Burger King – Home of the all American WHOPPER! As I spun my wheels sharply to the right so not to miss the driveway the saliva began to flow. I’m not kidding, I was drooling. All I could think about was that quarter pound flame broiled ground beef sandwich stacked with tomatoes, lettuce, onions, pickles with mayo mustard and catsup. Back in 1971 it was so wide and thick I could hardly hold it with one hand. I usually had it cut in half just to facilitate its polite inoffensive consumption. Remember the slogan “It takes two hands to handle the Whopper”? As I perused the outdoor menu, crowded with more choices than I coud ever imagine at a burger joint, there it was…the WHOPPER! But the options had changed a little. My choice was either a single, double or triple. TRIPLE? Who could ever consume a sandwich that was not only too big to hold with one hand but with 3 huge patties stacked between those two plate size buns? Well, to each his own. “I’ll take a regular Whopper and a medium coke,”I told the speaker phone outside my driver side window. I could not wait to dig into that luscious piece of heaven. I took the bag from the pimple faced kid and drove to the first open parking spot I could find. I reached in – pulled out the paper wrapped bit of nostalgia that so affected my glands – but what did I see? A drooping soggy sloppy keizer roll the size of my wife’s hand. Nothing at all like what I had remembered from back in the day. I thought, “what ever happened to the whopper”? So this burger, like everything else wonderful in our lives, we want to experience again in the same way we remember it, fails to meet our expectations! “The good ole days” will never be again. So hang it up, enjoy what you have in the now and stop wondering what ever happened to the Whopper! This entry was posted on Wednesday, February 20th, 2013 at 12:11 am	and tagged with 1971, BurgerKing, Cooking, Home, McDonald, nostalgia, Sandwiches, Twitter, United States, Whopper and posted in Uncategorized. You can follow any responses to this entry through the RSS 2.0 feed.